The Seismic Isolation Bearing is a prime example of Bridgestone’s cutting-edge technology with practical safety applications. A seismic isolation bearing is used to protect structures from earthquake damage, minimizing the disruption to people’s lives and allowing business activities to continue. Therefore, the demand for seismic isolation bearing is increasing day by day. The Seismic Isolating Rubber Bearing consists of alternating laminations of thin rubber layers and steel plates (shims), bonded together to provide vertical rigidity and horizontal flexibility. Vertical rigidity assures the isolator will support the weight of the structure, while horizontal flexibility converts destructive horizontal shaking into gentle movement. Cover rubber – the outer cover protects rubber laminations against ultraviolet rays and ozone exposure that deteriorate rubber. 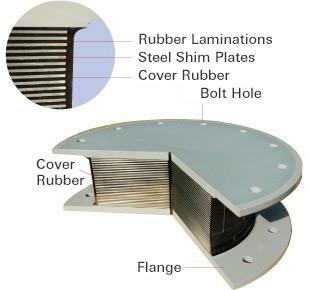 Bonding – through a proprietary surface treatment prior to vulcanization, the individual rubber layers and steel shim plates are permanently bonded together between the upper and lower flanges. 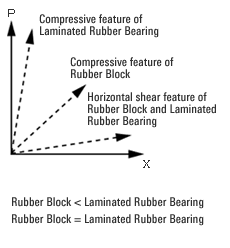 A standard rubber block can be easily compressed and sheared because of its biaxial softness. A laminated rubber bearing can be easily sheared, but its high vertical stiffness allows it to support a heavy structure such as a building.